Once a practical comfort item made by hand, down featherbeds are now a luxury item made from the finest materials. While down featherbeds aren't an essential bedding item -- unlike folks 100 years ago, people today put their down featherbeds on top of cushy mattresses -- they can make climbing into bed each evening a heavenly experience. If you enjoy pillow-top mattresses, love the feel of down or just want to try out a luxurious piece of down bedding, then you may enjoy down featherbeds. Keep reading for a few pieces of information that will help you decide if a down featherbed is right for you and, if so, which down featherbed is the right one. While the term “down featherbed” is usually used, “down mattress-topper” is probably more accurate. Down featherbeds are roughly six inches thick and are meant to be used on top of your standard mattress, giving your bed unrivaled softness, but also retaining the support of your spring mattress. Again, while the term “down featherbed” is often used, simply “featherbed” is usually more accurate. While the use of feathers may sound like a way of cutting corners, it’s really not. Feathers add bulk to a down featherbed so that the fill doesn’t completely compress when you lay down on it. While you can find some featherbeds that are made from 100 percent down, they usually are either very expensive or very thin. Some brands offer featherbeds that have a layer of feathers that form the base of the fill with a layer of down on top. This can be a plus or a minus, depending on your preference. In terms of warmth, sleeping on a down featherbed is a lot like sleeping on top of a down comforter. In the winter months, sleeping on a warm down featherbed is very pleasant. 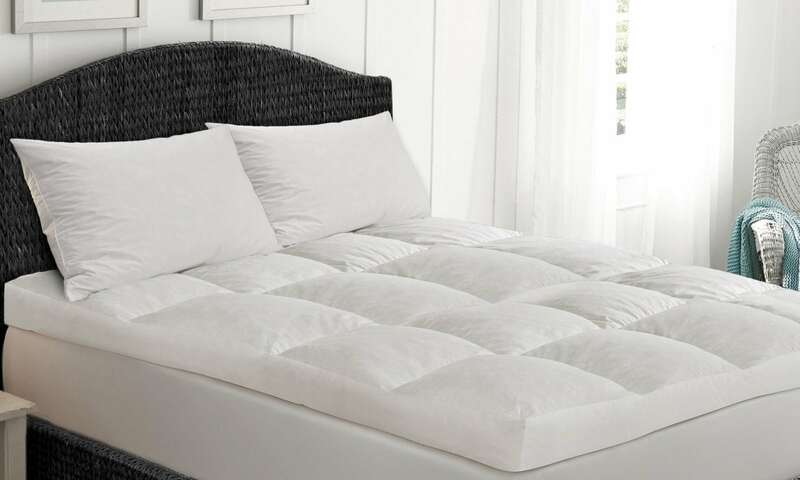 However, if you live in a warm or humid climate, or if you often get hot at night, a down featherbed may add too much warmth, especially if you already use down bedding. In terms of comfort, baffle-box construction is usually considered the best kind of featherbed construction. “Baffle-box construction” means that the bedding has been stitched with squares, like a checkerboard, and that the stitched squares on each side of the featherbed are connected by strips of fabric called “baffles.” That may sound confusing, but it means that the fill won’t shift around, so you won’t have to shake your featherbed every few days, and that your down featherbed won’t have any cold spots created by sewn-through stitching.